Finally, with only a week to go, they have released the El Cotillo Fiesta 2018 program of events! 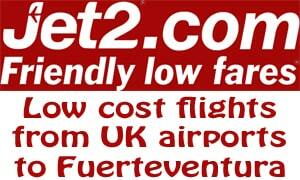 They don’t have a clue about publicity here in Fuerteventura. It all starts on Wednesday 15th August with a handball tournament on the beach and and finishes on Sunday 26th August.with a football tournament. 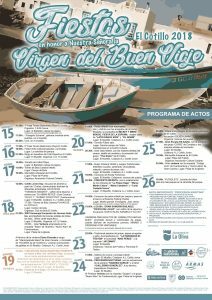 Sunday 19th starts after 12:30 – The ceremony of the Virgin del Buen Viaje when the statue of the virgin is paraded from the little church down to the old harbour. It is then put on one of the fishing boats and taken out to sea for a short voyage, followed by the other boats. Thursday 23rd 22:00 – traditional meal of grilled fish and Canarian potatoes along with music in the old harbour. Friday 24th 20:00 – the statue is paraded back to El Roque and then there is a firework display in the old harbour (the fireworks are normally very good). There will be VERY loud music played until 4am or so on many nights, usually in the little church square behind the hotel. Don’t expect to get much sleep then!